The power of the media has been flowing through AIC’s Communication Department this semester. 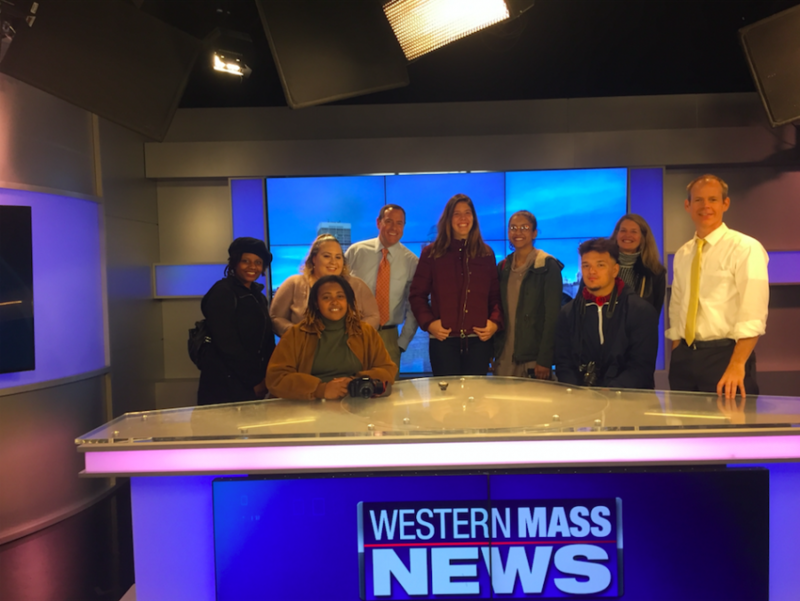 From world renowned guest speakers Kathy Tobin and James Villalobos in the classroom, to being up close and personal at the Western Mass News station, students are getting a good dose of media life. Having the opportunity to learn from people who are in and out of the business helps give a better perspective on what to look forward to when career time comes calling. Professor Patrick Johnson, who is also a writer for The Republican and Mass Live, invited James Villalobos to speak with his Writing for Media class. Villalobos is a 23-year-old Springfield native and UMass graduate, now reporting for Western Mass News in Springfield. Prof. Carol DeCarlo’s Introduction to Broadcasting class visits the Western Mass News studio. Yet he’s been on the scene since the age of 14, breaking barriers not many teenagers would think of making sure through his work that the world knew about different social injustices going on. From protest in Ferguson, reporting on the Flint Water Crisis, to being at the White House while President Barack Obama was in office, Villalobos has seen a lot. He took students on a journey many of us could barely believe, yet we learned one thing — we are ready to get reporting. Not even a week later, Professor Carol de Carlo gathered her Introduction to Broadcasting class and went to her old stomping ground of Western Mass News. As we arrived it was interesting to see so many people rushing by with white boards full of notes or folders with papers. Once the traffic stopped Chris Pisano, of the head reporters, greeted us. Explaining how they just had their morning meeting, so everyone was breaking into their individual assignments. 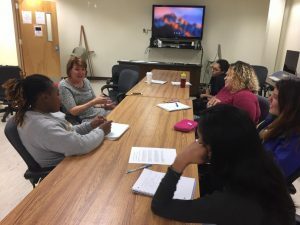 Veteran newscaster Kathy Tobin pays a visit to the broadcasting class. From left to right: Samira Abdul-Karim, Kathy Tobin, Shiane Wilkins, Aaliyah Ellison, Victoria Perini and Jaylan Ramos. It was funny because although it didn’t look like “The Office”, everyone was friendly and had a feel of family amongst each other, like on the show. During the tour we also caught anchor Jeff Cramer, who was en route to cover a story. He actually took the time to show us how we would actually shoot that, especially since now a day’s reports are also the photographer like a one-man show. From framing the interview and shooting both a and b role, it was a chance for us to see him in action one on one. 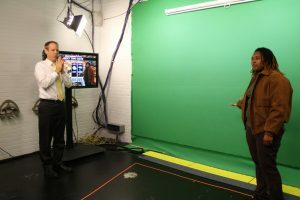 Yet it didn’t stop there — Meteorologist Dan Brown, got us on the green screen showing us the ins and outs of the weather. Teaching us where to stand, keeping our energy up and how knowing the information were talking about is important. So that the audience also feels what we’re saying so it is believable. As the tour came to an end, the final stop was reading off the teleprompters. Putting my foot to the pedal and watching the words scroll, gave me such a rush. I was ready for lights camera action. The class teased me because I didn’t want to get off screen. Yet it was the feel of having the opportunity to say what you want to an audience not many have the chance to reach — which is really why I appreciated the trip. Meteorologist Dan Brown runs through a weather forecast with Samira Abdul-Karim. “It is not always nice or pretty, but as journalist you are the future and checks & balances of the country,” said Kathy Tobin, Most Trusted Face in Western Mass News 10 years after her phenomenal career in TF news. She shared highlights of that with us during her visit to Prof. De Carlo’s broadcasting course. She explained her story, starting at a local station during her college years at Emerson expanding to a household name with her “Health Watch” segment. Tobin says she would take complex issues and break them into little sound bites. That makes good sense because as an audience we want direct news. She totally grasped knowing her audience, which stood out to me a lot. Even covering stories on campus I’ve learned it is about knowing your audience, as well as them being comfortable enough with you to open up and tell their story. As I reflected the semester all I keep hearing is, “You gotta try! Find a story, FIND IT! Then make it yours.” This advice from Villalobos, will carry out for not only the semester but also my life. In order to succeed, we must try and when we find what works we have to go with it. Most of all embrace it.